There are trends, it seems, that are large only in the minds and vision of those who forecast them! As we’ve wandered through High Point Furniture Market these past few years, it’s been hard NOT to pick up on a color or style, or item that keeps showing up in nearly every showroom. One year it was turquoise and citron green. The next Market it was as if the technicolor switch had been turned off and suddenly EVERYTHING, including fabrics, wood, rugs and art was a varying shade of gray: washed out, pale and neutral. It’s been fun to watch and see what you, our customers and ultimate critics, think of some of these must have “trends”. Which one’s become the has beens of yesterday, and which ones become the classics of tomorrow! This Market, I was thrilled to see that my longtime passion for sassy stripes was in full force. By sassy, I mean horizontal stripes, bold stripes, bright colors and patterns that turn up in unexpected places. It’s the more relaxed, contemporary sister of the traditional stripe, playful and slightly askew. We had the pleasure of attending the 100th Anniversary Party for The Hickory Chair Company. Their showroom is always stunning; leading the way in the design world, and giving us great ideas to pass on to you. This year it didn’t disappoint. There were sassy stripes everywhere! A grey and yellow Hickory Chair showroom vignette features this fabulous French style chair lacquered white with horizontally applied stripes – how sassy! Horizontal stripes were everywhere at market, but this was the most creative use. Pink stripes drawn onto white paper covered books made an incredible artistic bookcase display in a bold and colorful room. The Hickory Chair showroom continued to inspire – this classic wing style chair wrapped in a horizontal men’s wear stripe – so handsome. Horizontal stripes punch up the impact of this upholstered headboard. 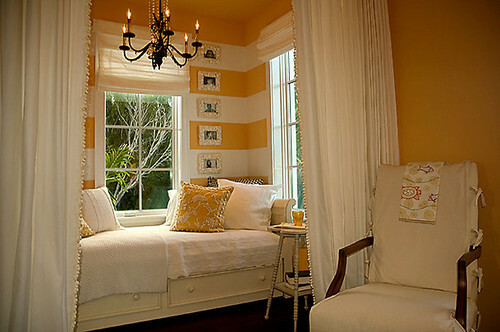 How about this incredible reading nook with horizontal stripes painted on the wall (Image via Houzz.com). Don’t be afraid to try this latest trend…horizontal sassy stripes. The smile on your face each day when you come home will be your reward! The Inman Park Tour of Homes – See You There!